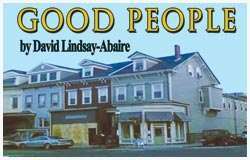 GableStage opened its production of David Lindsay-Abaire's Good People on July 20, 2013. The Pulitzer Prize-winning playwright pays his respects to his old South Boston neighborhood, with this tough and tender play about the insurmountable class divide between those who make it out of this blue-collar Irish neighborhood and those who find themselves left behind. Is it strength of character or just a few lucky breaks that determines a person's fate? Joe Adler directed a cast that featured Laura Turnbull, Barbara Bradshaw, Elizabeth Dimon, Clay Cartland, Stephen G. Anthony, and Renata Eastlick. If you believe anything today, believe this. There is great pleasure to be had right now at GableStage... Five of this area's finest actors are playing the desperate residents of South Boston and Chestnut Hill with such skill that the audience gasps of oh no and waves of nervous laughter fill the house as seemingly innocent jokes mask the pain in almost every line of dialogue. Laura Turnbull is listed at the top of the program with an “and” separating her from the other actors. It's easy to see why. Good People is a two-act play, about two hours long and Turnbull is on stage, brilliantly, for all but two minutes of the second act... Turnbull hits every nuance in Lindsay-Abaire's portrait of a tired woman at once pitiful, arrogant, meanly demanding and bolstered with principles that are of little use. Director Joseph Adler, who doesn't allow a slow moment on stage, has chosen a fiery cast, veterans who sell the show magnificently: Stephen G. Anthony as the boy who breaks out of the streets through his own cleverness and rises to a mansion with a black, well-educated and wealthy wife, Renata Eastlick, who must face the secrets of his past. And there's the inimitable Beth Dimon, staunch friend of Margaret and constantly feuding with Barbara Bradshaw, landlady, sometime baby sitter and bunny rabbit maker, and Clay Cartland, the store manager whose dead mother was also a classmate of Margaret's. And I’ll say it again, there’s great stuff going on in Good People. ...director Joe Adler’s top-notch cast offers a searing look at class divisions in the U.S.
Dottie (Barbara Bradshaw) is funny as Margie’s wacky landlord, and Elizabeth Dimon is hilarious as Jean, Margie’s outspoken, foul-mouthed friend. The comedy and camaraderie of Good People’s first half make the play’s intense second act all the more hard hitting. Joe Adler directs Good People with a sharp ear for the play’s riveting dialogue, which strikes a balance between deadpan, deeply sarcastic barbs and uninhibited insults and rants. Turnbull and Anthony exhibit spot-on timing and an explosive, antagonistic chemistry. Renata Eastlick rounds out the cast as Kate, Mike’s young, attractive wife who happens to be black. Kate’s role as a young intellectual professional gives the play a more contemporary feel, and her status as an outsider — she’s not from Southie — lets the audience see the play’s conflicts through a wider lens. Director Joe Adler has assembled an all-star cast for Gablestage’s Good People. Laura Turnbull as Margie understands the depths of the character’s struggles. By the end of the play, you’ve been thrust through Margie’s psyche from every angle, due mostly to Turnbull’s total immersion. Stephen G. Anthony evolves the character. It’s a complex performance, especially in the second act when the essence of the former Southie emerges at one point like the Incredible Hulk. Barbara Bradshaw as Dottie plays Margie’s rent-obsessed, crafty landlady with a ditzy appeal... Elizabeth Dimon as the no-nonsense, Jean, could have been plucked from the ‘hood. Her best moments are when she’s carping at Bradshaw’s Dottie — delivered with just the right snap and timing. Clay Cartland, who is becoming one of South Florida’s busiest actors, shows the right reserve with Stevie. Renata Eastlick rounds things out as Mikey’s wife, playing Kate with a cool detachment that eventually gives way to compassion. Adler’s skillful direction pulls everything together as he invites the audience in to this slice of life, playing up the underlying nature vs. nurture of Good People. One of the most sublime pleasures of this Miami summer comes just before the intermission in GableStage's new production of Good People, when Jean, a track-suited Bostonian played by Elizabeth Dimon, takes to her feet in a bingo hall and bellows, "Cocksucker!" Hmm. I wonder... New Times. "B. Kaplan." "Brandon K." Coincidence? The first act is mired somewhat by an uncertain tone that teeters at times toward mockery of Margie and her friends. This is partly because the landlady Dottie is both a venal grotesque and the most vocal character onstage. Bradshaw plays Dottie with gluttonous zeal; her wolf-like, frothy jaw leaves Margie no choice but to invite her in. Turnbull's Margie is revealed to be a witty, brassy dame whose uncommon grace could, with a better wardrobe and set of opportunities, easily land her in a position of power and wealth. Dimon rolls her eyes with the agility of a boxer's feet and gloves, heaping snark on the proceedings from the comfort of her plastic chair. The second act is... where the play really hums. The scene draws on many of the finer theatrical traditions, well-timed entrances and exits, constantly shifting interpersonal dynamics, and the offstage cries of a child. There's even a bar cart off to the side. At times, the tension threatens to break into incredulous caricature, but like Margie herself, it is able to hold itself together and transcend its circumstances to reach a subdued if unsteady triumph. Director Joseph Adler introduced the opening-night performance by calling the show "a piece that resonates for our time." Margie's story, though, is not one of a downturned economy but of a downturned society. It is not bound to any particular moment but to a cycle in which good people suffer when educational opportunities aren't evenly distributed and familial obligations come before personal advancement. GableStage presents Good People through August 18, 2013.